IF YOU ASK Yvonne Khouri-Morgan, principal broker and owner of Mauna Lani Realty, how she sells a client interested in purchasing a home on Hawaii Island, her eyes light up. Mauna Lani is one of four outstanding resorts along the 25-mile stretch of Hawaiii Island known as the Kohala Coast. Seven hotels, 10 golf courses (both public and private), numerous beaches, and a deep Hawaiian history distinguish the area. 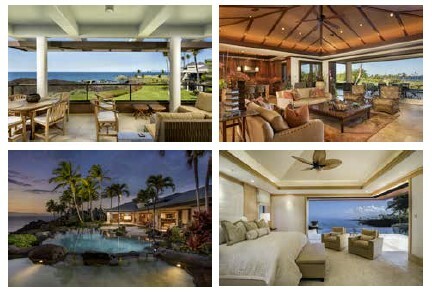 With 3,000 acres and three miles of ocean frontage, Mauna Lani is smack dab in the center of the action. From most vantage points, it’s possible to see the five surrounding mountains: Mauna Kea, Mauna Loa, Hualalai, the Kohala Mountains, and Haleakala across the water on neighboring Maui. As for residential opportunities, Khouri- Morgan says there’s something for everyone in the 16 different communities situated around Mauna Lani. The options range from townhomes to ocean front estates, and in price from $600,000 to more than $20 million. 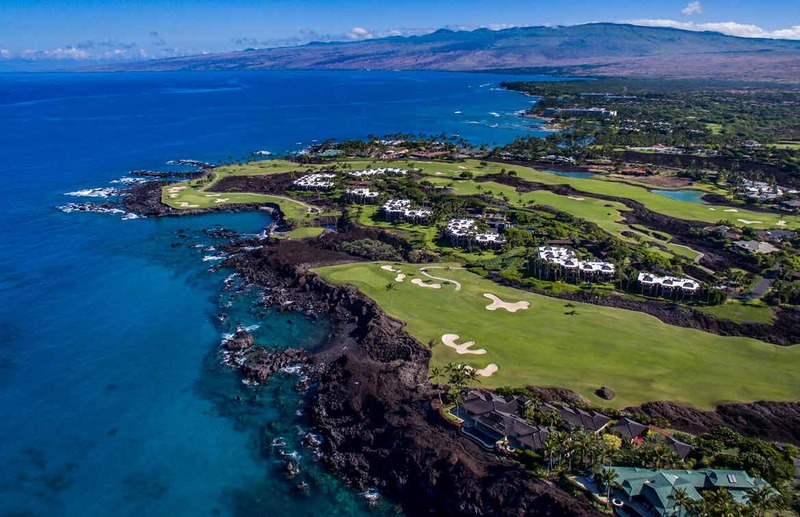 The two championship golf courses — Mauna Lani North and South — are immaculately manicured, with signature holes that rank among the most scenic you’ll ever play. The South Course features wide fairways bordered by smooth black and brown lava with broad views of the island’s interior mountains before emerging at the ocean. The experience is fun from the start, but when you get to No. 7 — a medium-length par 3 (163 from the white/109 from the forward tees) that plays slightly downhill with the ocean crashing against the rocks just to the left of the hole — your day gets even better. The South is the course over which the Senior Skins Game was contested from 1990-2000. A stroll through the clubhouse before or after a round reveals some memorabilia from those years when legends such as Arnold Palmer, Gary Player, and Lee Trevino strolled the fairways. The North Course is equally enjoyable to play, with holes that run through kiawe trees and down to the ocean. And for family fun or short-game practice, the nine-hole WikiWiki walking course is the perfect option. 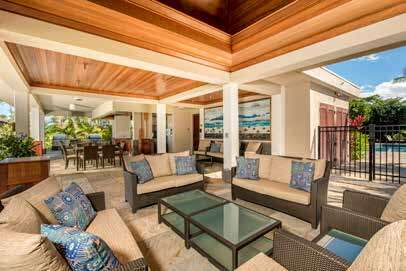 The Hawaiian cultural aspects of Mauna Lani contribute greatly to the authenticity of the resort. Fishponds dating back hundreds of years are preserved in perpetuity, and monthly music and “talk story” events are hosted by Mauna Lani’s cultural historian, Kaniela “Danny” Akaka, and held at Eva Parker Woods Cottage. Officially called “Twilight at Kalahuipuaa,” these shindigs have been held on the Saturday closest to the full moon each month for more than 20 years. The tradition harkens back to informal gatherings once hosted by some of the property’s earlier inhabitants, such as Francis I‛i Brown, who invited guests such as John Wayne and Bing Crosby over for drinks, music, and merriment. Today, the talk story nights are attended by 200 or more enthusiastic visitors and locals who enjoy Akaka’s stories, chants, and ukulele songs, as well as renowned musicians from across the state. The hotel where the Twilight gatherings are held — formerly called Mauna Lani Bay Hotel & Bungalows — is currently under a large-scale renovation, and will reopen in late 2019 as Mauna Lani, Auberge Resorts Collection, bringing additional sophistication to the property. Remaining open throughout is the popular, beachside Fairmont Orchid, where guests find 540 rooms and suites (including the renowned Fairmont Gold concierge floor), the award-winning Spa Without Walls, a 10,000-square-foot oceanfront pool, six restaurants, year-round children’s program, a fitness center, and tennis pavilion. Located in the cool upcountry foothills of Mauna Kea mountain, Waimea is home to dozens of horse and cattle ranches, as well as working vegetable farms that supply many of the fresh foods that are served at restaurants along the coast. Parker Ranch headquarters is a fascinating tour, as is the Paniolo Heritage Center at Pukalani Stables. Both tell the story of the Hawaiian cowboys who have worked the cattle herds of Parker Ranch and the other heritage ranches on the island since the 1800s. Waimea’s ranching culture is still celebrated to this day, with active junior equestrian programs, an annual Paniolo Parade, a Fourth of July rodeo, and a statue of Ikua Purdy, one of Hawaii’s most famous cowboys, prominently displayed in the center of town.